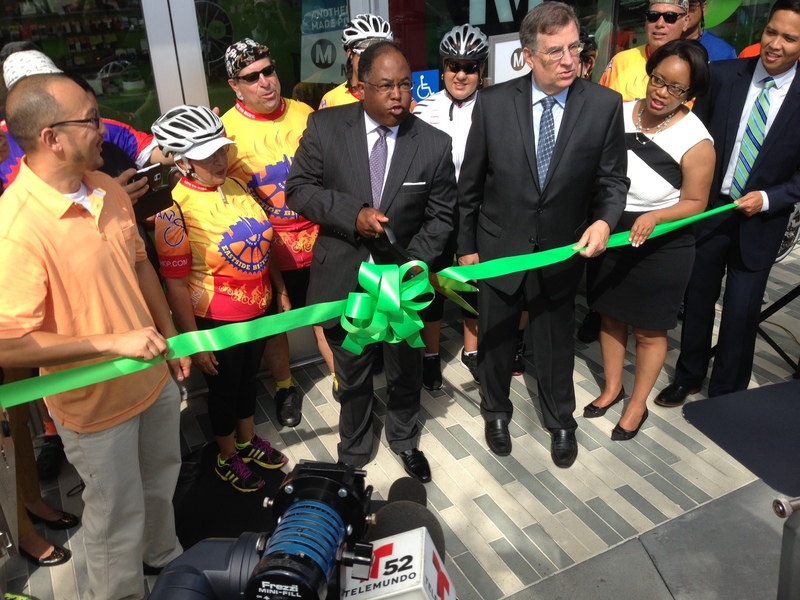 Metro Chair Mark Ridley-Thomas (center) cuts the ceremonial ribbon on Metro’s El Monte bike hub. To his right are Board Vice Chair John Fasana, and Deputy CEO Stephanie Wiggins. All photos: Joe Linton/Streetsblog L.A.
Metro celebrated the opening of the agency’s first bike hub this morning in El Monte. The hub is located at the El Monte Transit Center, a very quick 15-minute, 12-mile Metro Silver Line Bus Rapid Transit trip from downtown Los Angeles. 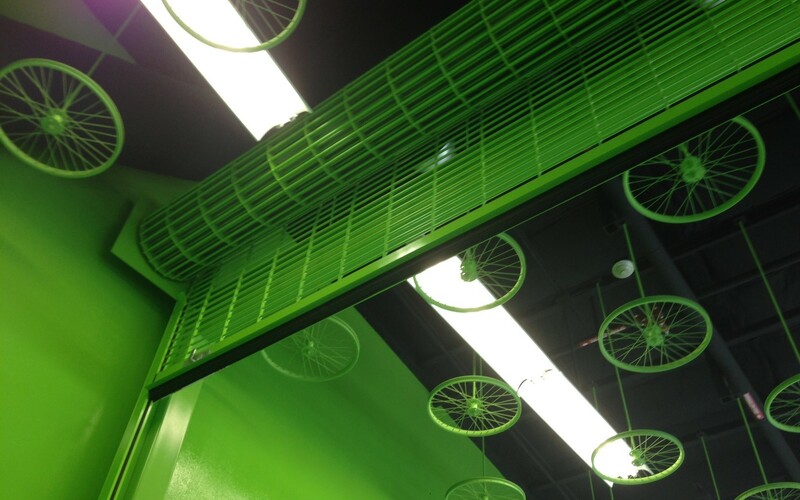 The hub combines secure bike parking with a small bike shop staffed weekdays, from 7 a.m. to 11 a.m. The indoor space holds up to 56 bikes. Securing a bike there requires pre-registration and costs $60 for a whole year, $12 for 30 days, or $5 for a week. The facility is operated by BikeHub. See their website for lots more details. Metro Board Chair Mark Ridley-Thomas, Board First Vice Chair John Fasana, and Deputy Chief Executive Officer Stephanie Wiggins were on hand to speak to the press, celebrate, and cut ribbon and cake. In his remarks, Fasana called for expanding Metro bike share to this location, though that’s likely to take some time. Metro plans to open additional bike hubs at Metro rail stations in North Hollywood, Hollywood, Culver City, and Union Station in the next couple years. See future hub details at The Source. For a long time, the El Monte Transit Center (now apparently officially “El Monte Station”) has historically been a somewhat neglected stepchild among Metro facilities. The site anchors the east end of the 10 Freeway busway (now ExpressLanes), so it is well served by actually-rapid transit, but it suffers from some of the car-orientation that clusters around freeways. Sometimes it felt like a transit hub tacked on to a bus yard, surrounded by surface parking lots and parking structures, up against a freeway, tucked along an industrial area. With a recent full-scale renovation and expansion, plus today’s bike hub, expanded Silver Line and Silver Streak service, a refurbished connection with the Rio Hondo bike path, and an initial phase of mixed-use transit-oriented housing appearing complete, the El Monte Station is looking pretty good. It’s not Times Square, but its infrastructure and appearance are more becoming of the key roles it plays for San Gabriel Valley bus riders. Photos of this morning’s opening follow below. 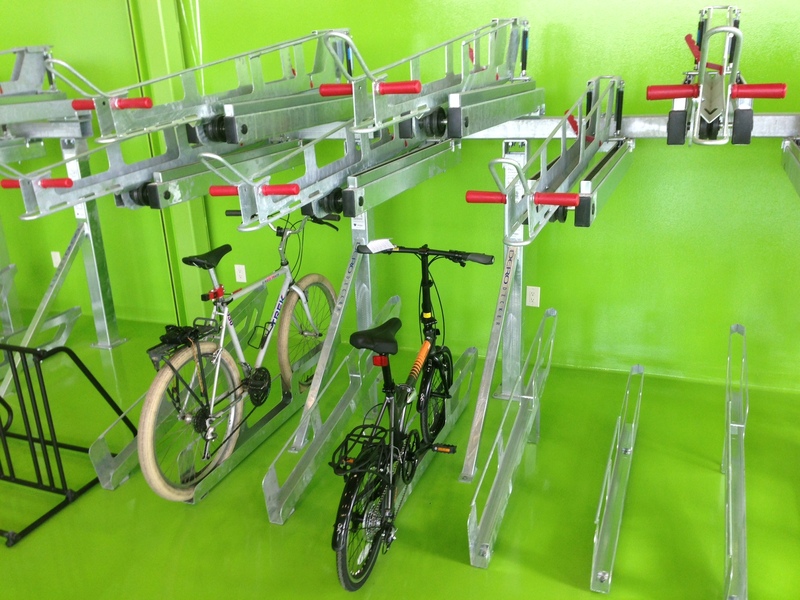 The El Monte Bike Hub features secure double-deck bike parking. 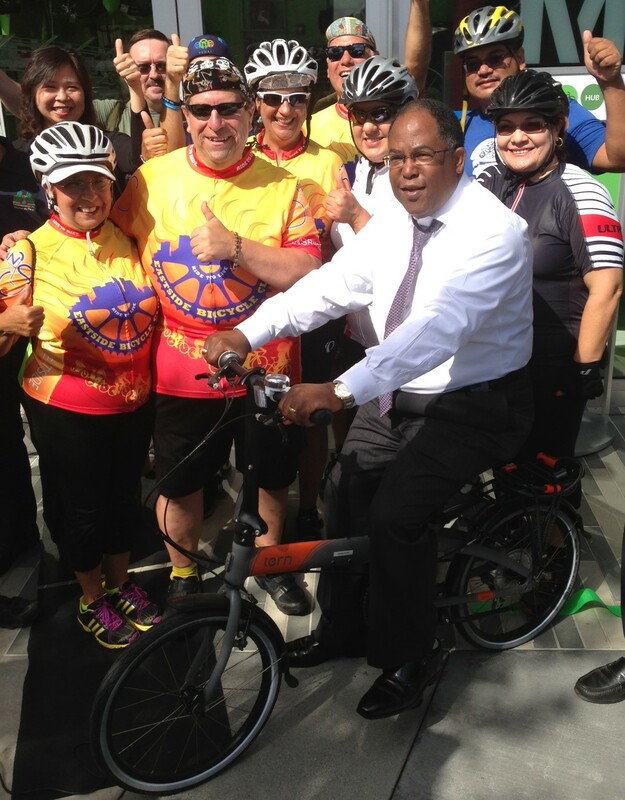 Supervisor and Board Chair Mark Ridley-Thomas poses with the Eastside Bike Club. 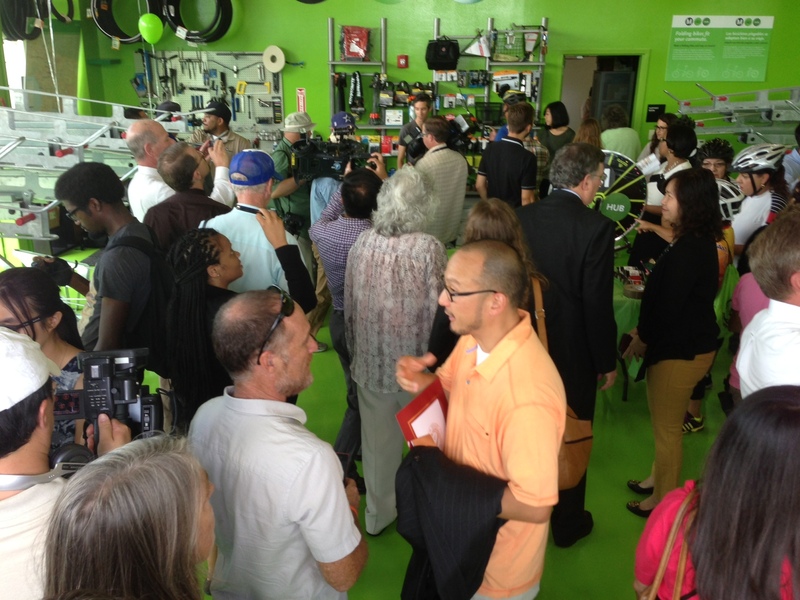 The interior of the hub – with cyclists, agency staff, elected officials and others celebrating. Center (in orange shirt) is Gene Oh, owner of BikeHub, the operators of the facility. 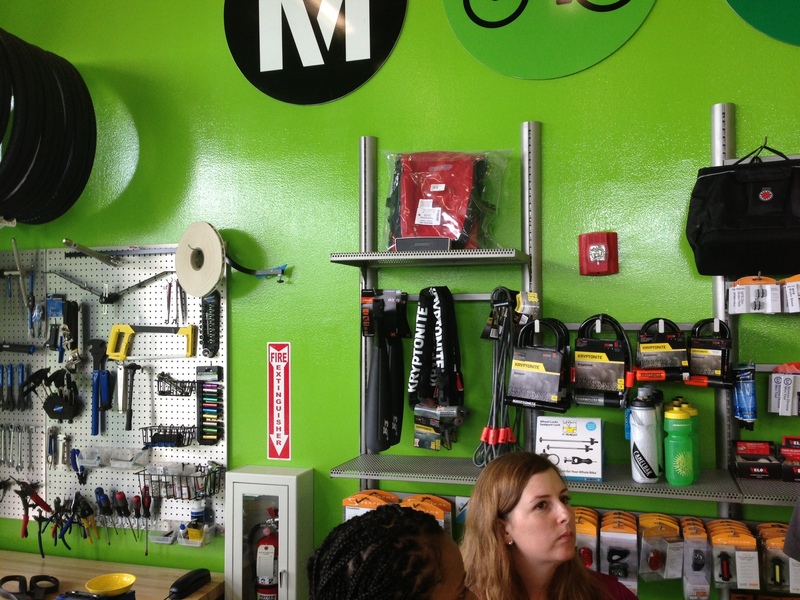 The hub features a mini-bike shop, with gear, repair equipment, etc. for purchase. When the mini-shop is closed, this gate is rolled down to secure it. 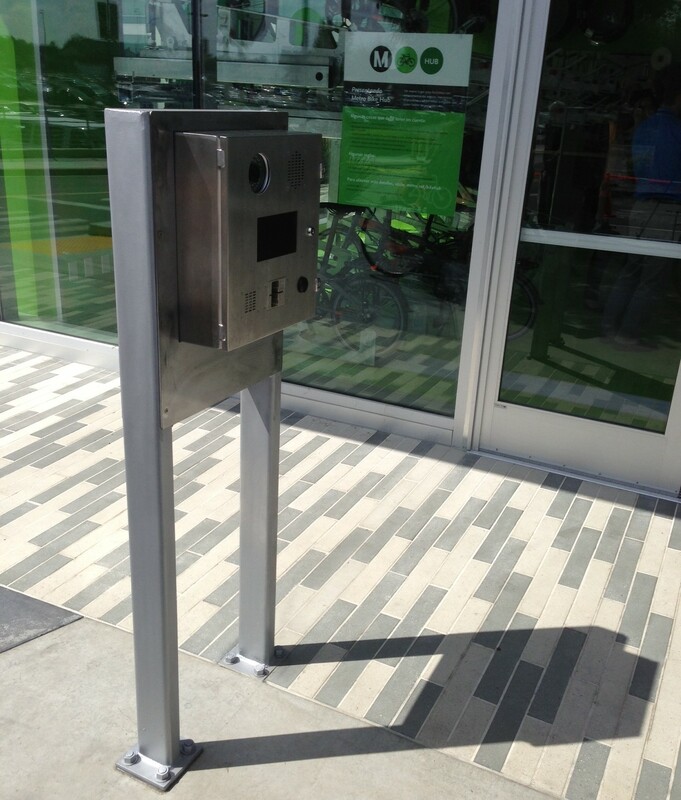 24-hour access to the secure bike parking area is via this automated security device, which reads the user’s drivers license. Nearby existing (free and unattended) bike parking is quite well-used. 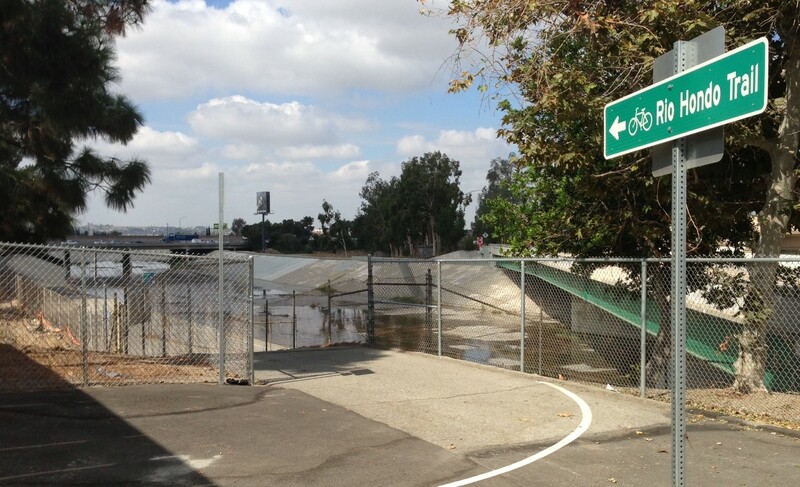 For years, the connection to the Rio Hondo bike/walk trail was fenced off. It’s now open, and has directional signage and sharrows for a convenient connection. 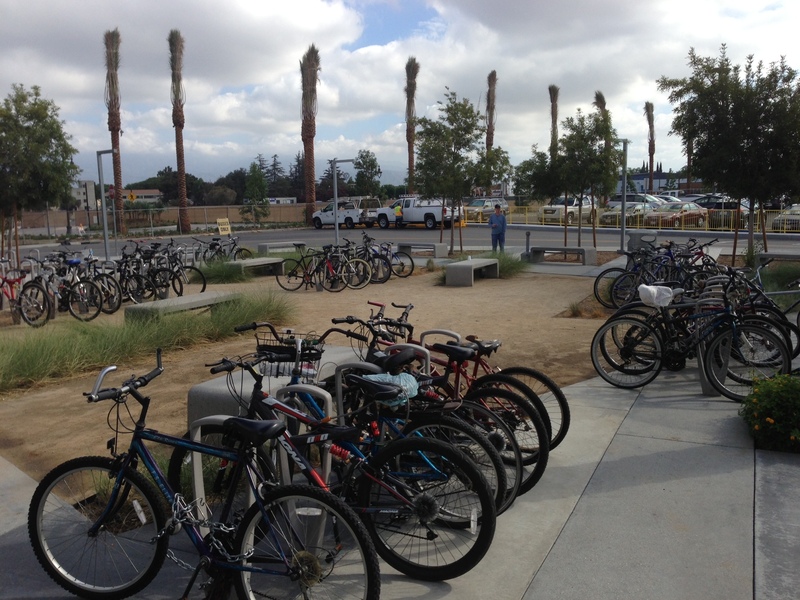 Additional coverage of the El Monte bike hub opening at The Source, Curbed, and CBS. When was the last time Mark Ridley-Thomas has sat on a bicycle? I’m thinking it was the last time there was a photos op. Really if these guys want to make an impact with bicyclists, show up at these events on bicycles riding from their offices! This way at least we have a hope that they see what cyclist face out there. I guess they know better huh? Lots going on: Union Station Metro Bike Hub groundbreaking, Blessing of the Bikes, Bike to Work Day, and Hollywood Metro Bike Hub opening!